The options market is a forecasting model, continuously adjusting prices based on expectations of future movements of underlying assets. The market is sensitive to time because options have expiration dates. Erosion of time means value is disappearing. One focus of the options market is valuation over a relatively short period compared to assets that have no expiration date. Another focus for valuation of options is volatility of the underlying. With time growing short, it is imperative for the underlying price to move toward a profitable level — either up or down depending on the trading strategy. Options that reflect low volatility for the underlying quickly move down in value, approaching a price of zero or intrinsic value (the underlying price less the strike price) before those that have superior implied (or predicted) volatility. 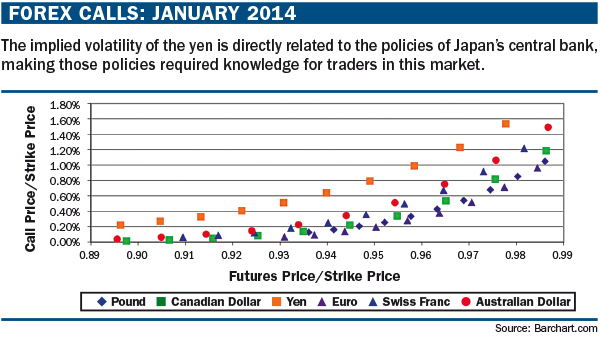 Volatility differences are illustrated in “Forex calls: January 2014” (below). The Japanese yen (CME:J6M14) is the current champion of volatility, primarily due to the strategy of Japan’s central bank to keep interest rates low enough to drive the yen’s value down. The yen’s volatility is expected by the options market to remain high at least through the next six months because these are calls that will expire in June 2014. What if — similar to the U.S. Federal Reserve Bank’s decision to taper its Treasury purchases — Japan’s central bank decides to keep its currency at a level price with reduced volatility? 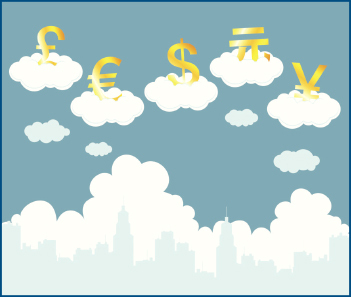 This possibility and others like it at central banks in other countries make it important for traders in forex to consistently assess central bank intentions and the economic background for their actions.